Bifold doors are made up of 2 sections with one fixed and the other movable. Such door can slide as well as fold and offer both style and space saving functionality. 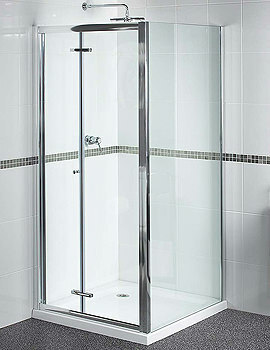 Particularly in a bathroom that has space constraints or shower location immediately adjacent to other elements such as an entryway, toilet, or vanity, a bi-fold shower door may be the perfect answer to your design criteria. Among the items in our collection of bi-fold shower doors are examples to perfectly finish the space by creating a visual impact with clean lines and understated elegance. The wide variety of doors listed on our site opens up a whole new spectrum of design opportunities, greatly expanding the options available to the consumer while making the best use of bathroom space.